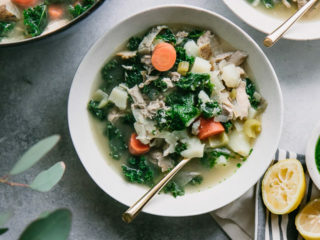 Pesto Chicken Kale Potato Soup, a simple seasonal homemade soup recipe made from scratch that’s ready in under an hour and is perfect to make ahead for meal prep or freeze to eat all season long. Chicken soup for the soul! Heat oil over medium heat in a large soup pot, then add chopped onion, carrots, and celery and cook until they begin to soften, 3-5 minutes. Once softened, push vegetables aside and add chicken breasts, salt, and pepper. Sear chicken breast about 2 minutes each side. When chicken is seared, add broth and bay leaves and increase heat to bring broth to a boil. Then reduce heat to medium and cook covered for 20 minutes, or until chicken is cooked throughout. Once chicken is cooked, remove from broth with tongs and let cool on a cutting board. Add potatoes to broth and increase heat to bring soup to a rolling boil to cook potatoes until soft, about 10 minutes. When chicken is cooled, use a fork to shred and then add back to the pot. Cook a few more minutes, or until potatoes are soft when speared with fork. Then add kale and lemon juice and cook until soft, about 2 minutes more. To serve: spoon soup into bowl and top with 1 tablespoon pesto. Nutrition notes: nutrition information calculated for 1 serving (about two cups) with 1 tablespoon pesto. It is high in protein, potassium, and vitamin A and features ingredients that are readily available in the colder months of fall and winter.